Pápai Páriz Ferenc, Album amicorum p. 459. IV Kalend. Decembr. 1719. Phil. et Med. Dr.
* Hebrew quotation: Ps 25:5: Hadrikheni va’amitekha. “Lead me in thy righteousness”. 1) In the Masoretic text there is a dagesh forte in the tav of “va’amitekha”, while this is missing in the album. 2) The quotation ends here with a sof pasuq (final dot) – this is naturally missing in the Masoretic text, as there the verse is continued. 3) In the album there an accent sign can be found only under the qaf of the first word, all the other accent signs are missing. * The Greek is quoted from Aischylus, Fragmenta 390. Let fortune be in proportion with efforts. György Komáromi learned in Nagyenyed (Aiud), and went to higher studies (subscribed) in 1701. His name is followed by the inscription that he was tutor (“paedagogus”) of Count Zsigmond Bánffy, and that he had set out to foreign academies (“in acad. ivit”). Later he learned at the university of Leiden. 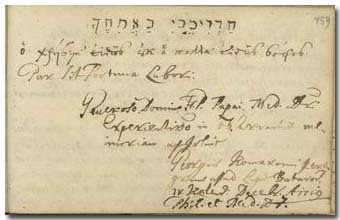 György Komáromi was already a doctor of philosophy and medicine when he wrote in the album of Pápai Páriz in Leiden in November of 1719.